CTF 525 Short Cut Staple Fiber is a high tenacity, high modulus second generation acrylic fiber used to improve crack resistance and fracture toughness in friction materials. Fiber lengths of 1.5 mm, 3 mm and 6 mm are available. 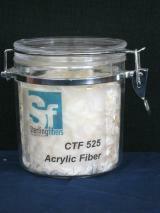 CTF 525 exhibits excellent adhesion to phenolic resins and splits / fibrillates to absorb crack energy.